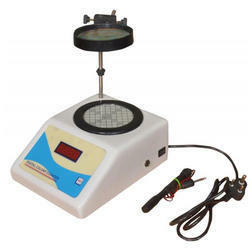 Manufacturer of a wide range of products which include colony counters. With our rich industry experience, we have established ourselves to offer a wide array of Colony Counters to our valued clients. Used for counting colonies of bacteria or other microorganisms, the proffered compilation is easy to use and reliable in performance. Owing to the tough construction, portability, and consistent performance, the selection is massively acclaimed among our customers. The series can be obtained at affordable costs.